The authors are the same ones who wrote our FAVORITE "Dragons Love Tacos" and so I snagged it and started planning. Next up I gave each of the kids a paper plate and got out a ton of different papers, markers, tissue paper, glue, etc. ... and brought out this circle punch to make pepperonis. We cut up sparkle paper to make green peppers and meatballs, Luke made strips of Canadian bacon (his favorite) and Mason even added some purple onion. We crunched up some brown packing paper and I hot glued that on for the crust. Luke (always the innovator!) turned his plate the opposite way of the littles so his was a "deep dish" pizza. He trimmed off the edges and it was so cute! Of course Griffin had to have pink pepperoni! In the story the raccoon is the main character and so we made raccoon magnets using clothes pins, a few pages from an old book, glue, googly eyes and black paper. Because these were a little bit more detailed to make I did these one-on-one with each of the kids. I took one picture because we were cutting and gluing but you can get the general idea... we glued stripes down and then cut the tail and face out. Super simple. After they were assembled I hot glued a magnet onto the backs and we were done! We used the magnets to hold their pizzas up on the fridge so it looked like the raccoons were running away with the pizza just like in the book. ... and then I threw some pizza goldfish on the plates along with their yogurt, fruit and such. That afternoon I cut out these masks (from the same printable site as the word search above!) and then pulled out supplies for the kids to make them their own. Luke and Mason opted for crayons and Griffin used watercolor paints. After they were done I hot glued a popsicle stick to the backs so they could hold them. Except for Griffin who couldn't stop smiling :) Isn't her mask fabulous?!?! I left her painting at the kitchen table while I went to the bathroom and put away a load of towels and came back to her fantastic rainbow creation. 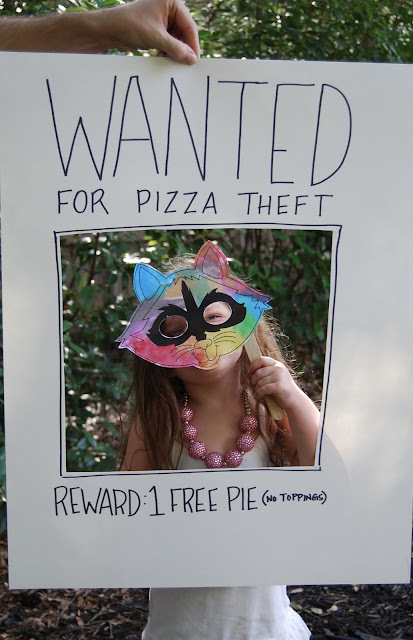 After Griffin painted her mask she wanted to keep on painting so I traced a plate to make a couple of circles and then sketched on some easy pizza toppings. I ordered this puzzle for the book club day because I wanted Luke to feel like there was something geared just toward him. He LOVES a good puzzle and this one is for sure a challenge! We downloaded several "pizza fraction" apps and Luke had a great time with those! I picked up dough, sauce, cheese and meatballs and Trader Joe's and we were in business! It was such a fun day and we all ended it even bigger fans of pizza than we were before :) The kids thought the book was funny (although it was no "Dragons Love Tacos") and we had fun crafting, playing and eating together. PS - This book has a line about "secrets making things fun" and we took this as an opportunity to reiterate to our kids how secrets really aren't fun.... that we NEVER keep secrets from our mom and dad and the difference between surprises and secrets. Just wanted y'all to be aware in case your kids are younger or you wanted to think about this conversation ahead of time! PPS - This post contained affiliate links... thank you so much for supporting my blog! Ah! This is so cute!!!! Those wanted signs are adorable!! That looks like such a fun day! Thanks for all the great ideas too! I'm definitely tucking this idea away for a rainy day. We adore Dragons Love Tacos so taco themed book party may be happening this summer. Thanks for the idea! Incredible...just so much fun. What a great summer activity!!!! Way to go! You've done it again and I love your disclaimer about secrets versus surprises! 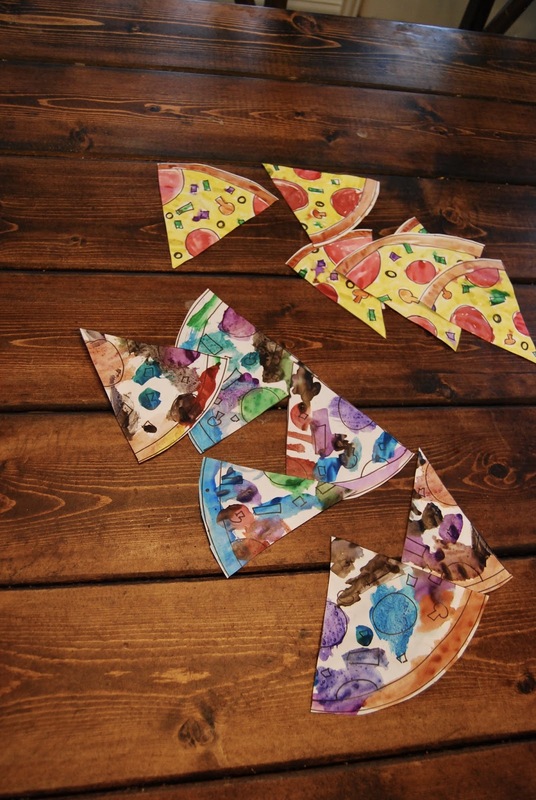 Thanks for inspiring us mom's to get crafty with our kids! What is your book storage like? I find that we are overflowing with books! I try to weed out as the kids get older, but some have some sentimental meaning to me. Your Family Book Club posts are my favorite!!! This is fabulous! I have emailed this to 6 friends with small children. Thanks for sharing. It sounds like it was such a fun day!! This is just the cutest themed day!! When I have grandkids (because that is the season that is up next for me! )...well someday I hope! LOL I am going to be the coolest grandma because I will have all these awesome projects that you have told us about! I love your family book club days! How often do you do these Family Book Club nights? I would love to start doing this. Is it a once a month thing, etc. Do you have any more posts about your family book clubs? What a fun way to spend the day, unforgettable memories being created! Love your creativity. I LOVE these posts! My little just made 1 but I've pinned every single book post to use when he's a bit older! I love it and I love the little PSA at the end regarding secrets. We always say to our kids we don't keep secrets just surprises. Andrea, this post was so fun to read and I can imagine how fun and special the day was for you and your kids. Thank you for this FABULOUS idea! Wow, I am just so impressed at your creative gifts and appreciate you sharing them with us!